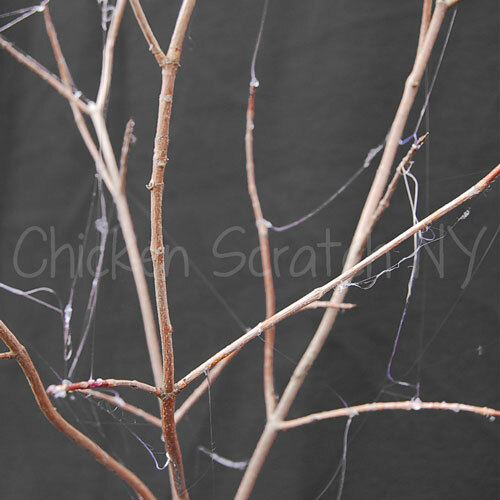 Today I’m going to show you how to turn a mistake into some spooky decorations with a tutorial on hot Glue Spider Webs. I usually like my Halloween decorations on the creepy side, the bloody flowers might have hinted at that. I can’t stress enough how simple this project is, you can’t mess it up. The ‘technique’ (if you can call it that) is basically messing up, over and over again. You most likely have everything you need Right Now. First, find several branches, the more pokey-out bits the better. Tape or glue them together, once you start the webs you want them stationary. Unfortunately, I don’t have any pictures of the actual web making, you have to go really fast and I couldn’t take pictures while doing it. You know those really irritating glue strings you get when ever you use your hot glue gun that make you swear upset? That’s what you are trying to do. Make sure the glue is as hot as possible, don’t be like me and try to do it too soon before the glue is warmed up. Make a small blob of glue on one branch, QUICKLY drag the glue to another branch. You can do this two ways. 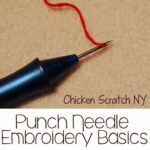 One, use the gun itself, moving from spot to spot adding a tiny bit of glue each time. That gave me thicker strings. For the really thin ones you’ll need another stick or a toothpick etc. 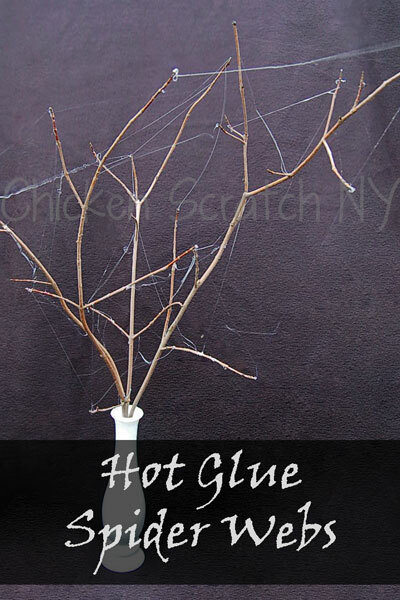 Make a small blob of hot glue, stick the toothpick in and drag it to another branch. Keep going until the glue stops being stretchy or gets too thin. You might need to wrap it around the branches to get the end to stick. It gives you a more realistic look than fake web, it’s slightly shiny and moves in the wind. If you get big blobs that are too visible just break them off. It’s not a particularly saveable project but I think the speed and thriftiness makes up for that. So creative!! I can’t wait to make spooky spider webs … pinned! That is super clever!! 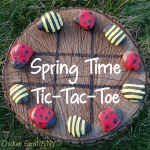 Thanks so much for sharing this fantastic idea with us last weekend at Inspiration Friday!